Today I went for my very first adult swim lesson. Big step. I know my end goal though so I know I have to get some guidance – what better way than a proper lesson? Rather uncharacteristically I arrived at the pool early. Probably a good thing too seeing as I sat in the changing rooms for a good 10 mins telling myself to grow a set and just get out there! I was meeting the instructor at the shower cubicles which is right at the pool edge so I slipped in to the water and kept an eye out for the black t-shirt they said they would be wearing. I’m saying ‘they’ at the moment as I had presumed it would be a woman. No idea why but that is what I presumed. So naturally, me being me, it threw me just a little when this young lad came up and asked if I was Ella. Cue me sinking even lower in to the water. The lesson started off with me doing a short length and he assessed my technique. Luckily it turns out I’m not as bad as I thought I was. I did still swallow about half of the pool, still panicked a little when I tried to take a breath and my mouth was instead filled with water, and I still lost all sense of direction at points BUT IM NOT THAT BAD! My arm strokes are good and long, my elbow is sharp and my kick is ok. He didn’t laugh when I told him I was aiming to do triathlon, there was no ‘yeah fat chance love’! Instead he had me going backwards and forwards, counting my arm strokes to judge when to breathe and basically just practising. He said I should probably work on my stamina for swimming which, if I’m honest, I was a little offended by at the start but I would have to admit I think he’s right. It’s completely different from running and cycling as it’s different muscle groups and to tell the truth, I was knackered by the end of the lesson! It was a good session though and it’s given me a lot to work on. So yeah, another step forward, and another set of goals to work towards. I will crack this, loads of practise to get in, distance to get under my belt (well swimmie) and all that. Next lesson is next week but I will get to the pool before that – #determined. After watching a triathlon the other week and it playing on my mind for sometime now I decided to go and see just how bad I was at swimming. Not very positive I know but, the result was just that, bad! Breast stroke Im not too bad at but front crawl is pretty much non existent. Kind of a problem if I am even considering a triathlon! So, I took the unusual decision to admit this via Facebook (why not? I mean I just love putting myself out there! Cringe). Anyway, it turned out to be quite a good idea as I had a huge number of people then telling me they couldn’t swim either and that such and such they know is taking lessons. I had already asked at the local pool and they only do lessons during the day – they also gave me the impression they were filled with pensioners so I gave that a bit of a body swerve. Luckily though I have found a school who can fit me in this week and next! And even more luckily for me I think it’s actually going to be 1 on 1!! The thought of a class has had me in palpitations and thinking I might give it a miss but I have been working on overcoming some of my anxiety and this definitely looks like a positive. Time can only tell! I’m still running, managed a half marathon at the end of last week and I have the local 10k this weekend. I also did a Farklets session yesterday – it very nearly broke me! Half marathon on the Friday, 7k on the Sunday, straight to the gym to do Farklets on the treadmill then weights after. Needless to say my legs weren’t lifting anything after that ha ha. Took it easy today though, trying to stay sensible. Can’t wait till my first swim lesson! Thanks to runvivvyrun for the tag on these questions. Here’s my answers. 1. Would you rather run along a beach path or a mountain trail? I have limited experience of running a beach path and being a Scottish lass I love the mountains! However, when running anywhere that is a trail, to me, everything on the ground is a snake until proven otherwise and there is someone behind every bush about to jump out until I go past! This is probably why I have managed to improve my pace – I’m running scared! 2. If you could choose the flavour of Gatorade at your next race’s aid stations, what would it be? Never tasted Gatorade but I tend to go for berry flavoured juices where available. 3. If you’re given $100 gift card to a running store, what would you purchase? Right now it would have to be trainers – I currently only own one pair and I’m out running nearly every day. With my goal of a marathon next year and more obstacle courses I’m going to need more! 4. Do you prefer to use a training plan or wake up and then decide how far or fast you want to run? I roughly follow a plan – I’m currently training for my first official half marathon so wanted a guide to help. I have found though that for long runs I have to have ‘prepared my mind’. I need to tell myself ‘I’m doing 15km today’ or I’m not focused enough. 5. Would you rather start your run with the uphill and end with the downhill or start your run with the downhill and end with the uphill? Oh definitely end with the downhill – my last long run ended with an incline and I found it really tough! I currently do weight training about 3 times a week and I have plans to include cycling and swimming too. Well, once I learn to swim properly! 7. What is your preference – out and back, point to point or loop runs? Out and back is my favourite, loop runs I can handle as long as it’s not excessive, point to point is a nightmare for getting back. 8. If you could recommend ANY running related item to a new runner what would it be? It would have to be some kind of timer that shows your progress – when you’re just starting out the thing that keeps you going is knowing you are improving. I use Strava app which shows me certain segments and gives me challenges that way, and I also have a Garmin Forerunner that gives me basics but I’m going to upgrade that. Other than the non existing snakes and bogey men behind the bushes it’s generally the usual squirrels, rabbits, deer and dogs. Sooooo many dogs ( some of which are wild in nature!). 10. Ever gotten lost whilst out on a run? The last trail race I did I was very concerned I was going to go the wrong way! It was a small event of about 135 so there were gaps and no crowding other than the start. I didn’t and I made it to the end but it was a concern – especially on a trail! 11. If you could have one meal waiting for you when you get home from a run for the next 30 days what would it be? That’s a very strange question, I don’t know what I’m having tonight never mind the next 30 days. Recently I’ve been thinking about my protein shake during the last stretch of a run or ‘justifying’ a red bull- but that’s just because I like the taste of them. Food wise, I really don’t know, I’m not a big food fan and don’t like big meals. Maybe some mango and ice cream. 12. Capris or shorts – what do you run in the most? Oh honey the world is not ready to see my legs in shorts! Took me a while to wear capris! It is always between 2 and 3km. It’s in the back pocket of my running tights. I hold my phone – always have. I don’t like the arm holders. 15. If you could re-live any race that you have done in the past, what one would it be? 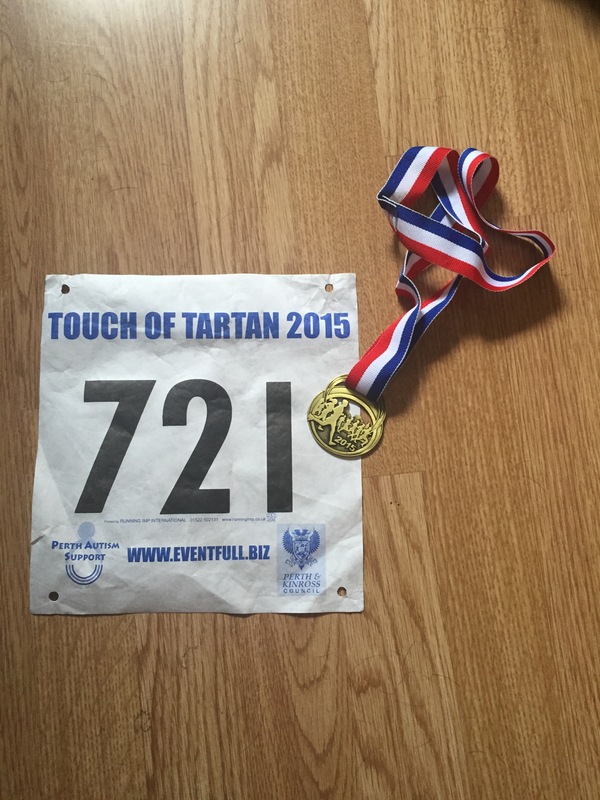 That’s quite a tough one, would probably be the Edinburgh 10k though – my first official race. I would soak up the atmosphere more and hopefully not be so nervous! 16. What type of run is your least favourite? Treadmill – there’s a reason it’s called a dreadmill. 17. When you go for a run, do you leave from the front door or drive somewhere? I generally go from the door but if I need to drop the kids at my parents I start from their house. 18. When running in daylight are sunglasses a must or a nuisance? I live in Scotland, the sun is rarely an issue! 19. When you get tired what keeps you from quitting? Focus, it’s always focus. If I’ve set myself a goal I go for it. If I need a 30sec walk time I will have it but I have to do something to make myself earn it – ie get to the corner, get to the next tree/lamppost, get to a certain km. 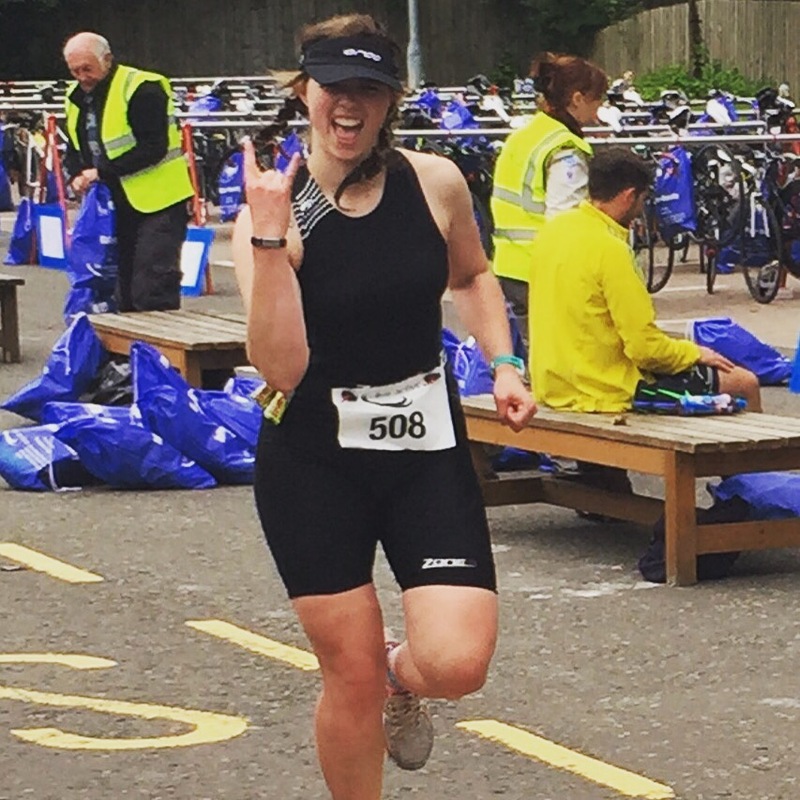 Yesterday my other half and I got up at 4.45am so we could drive an hour up the road to watch our friend compete in her first ever triathlon (well I did, he got up at 5.30am). Let me tell you, it was worth every missed minute of sleep!! We have followed her antics over the last couple of years as she took on the challenge of a marathon and achieved that in Edinburgh last year. 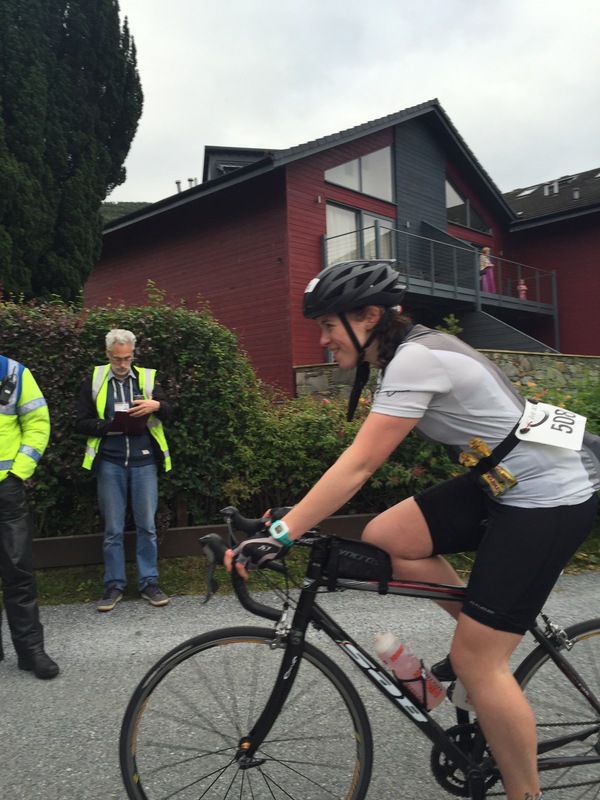 She then set herself the challenge of a triathlon – a middle distance one too – and smashed that! We arrived after they had entered the water so it was a very careful watching game to spot her coming out. I think we may have just missed her as the other half spotted her coming through the transition gate on her bike. She looked nervous but confident – I wasn’t sure whether or not to cheer her on as I was worried I might give her a fright and cause her to fall off! But then I thought there’s nothing better than knowing someone’s cheering you on so I yelled at the top of my voice. She spotted us and gave us a huge grin. She was going to ace this! We then did a little research – the husband has his sights set on a triathlon so we wanted to see more of the detail. How strict was the transition, what did the holding gate look like, how were the bikes racked up etc. We spotted quite a few swimmers with gloves and shoes too which we thought odd as what we had read so far had us believing he wouldn’t be able to use them. He has Raynauds phenonmenon so it’s a concern. We slowly walked back to the car – she was off on a 90k cycle on closed back roads so we couldn’t get near, this left us some time. We got chatting to some relay swimmers on the way back who informed us the swim had been shortened due to expected Loch temperature and that’s why the gloves etc were permitted. Back at the car and we drove to T2 (second transition from bike to run), parked up and went for a cup of tea. Chatted the whole time about how friendly the atmosphere was and how tempting it was to join in. The other half was feeling very jealous he wasn’t out there ha ha. We spotted a sign for a local half marathon there too in a couple of weeks….. details noted and entries may very well be going in soon! Back at T2 and we watched the first lot of athletes come in. They were very competitive! Lots of shouts of ‘you’ve lost 6 mins pick it up’ and ‘3 in front’. Surprisingly the relay people were not the first out, some of them were actually amongst the last. We had expected the relays to be some of the fastest. We picked up some tips from the officials from triathlon Scotland. Small things such as your race bib has to be at the front when leaving for the run, you get penalties if you drop anything on course, when you come in on the bike there’s a Marshall to take the bike from you etc. Really picked up some good stuff! Ginnie came in all happy smiles and raring to go – she looked good for having just done that swim and bike ride! She quickly changed to running shoes etc and went by giving us her usual 2 fingered tongue out pose ha ha. We knew she would be about 2 hours for her run so we spent the time cheering the insanely fast people coming in and betting on who was next. There was a Tri club from West Lothian and the support they gave was incredible! They had one person down the track a bit sending messages up to say who was coming and then the clapping and cheering and cow bells would start. It was truly amazing. They cheered everyone else too but you knew instantly when it was one of their own by the level of noise. Ginnie came in strong, didn’t look too tired at all! We had chosen to cheer at her final corner so her partner and parents could get good photos and videos at the finish line. She hadn’t expected her parents to be there as they were on holiday so there were many tears, bless. All in all a fantastic day! Different being on the other side of the race track but wouldn’t have missed that for the world. She truly is one inspiring individual and yup, looks like I now have a triathlon in my sights! For about the last 4 years my town has held a kilt run in the summer trying to break a record set by our twin town in Canada. We haven’t broken it yet but there’s quite a few people willing to run 5k wearing a kilt in my town so I thought I would try it this year. My youngest had had me up all night the night before so I was exhausted but I had signed up for it and borrowed a kilt from a work colleague so had to do it. The event is only about 3km away from where I live so my mum and I walked down with the little one in his buggy. The path to get there is also the path the run is set on and since there was a half marathon event that had started earlier we passed quite a few still running it. We got to the North Inch (where the event was) and I went looking for the registration tent. Could I find it? No. Couldn’t even find any marshalls to ask so my mum asked another runner. Back to Bells Sports Centre we went so I could register and I had to wait while it took 3 people to say to the person in front their mum had picked up her number earlier. This took some time and a large queue started forming behind me. Eventually one of them asked me if I had registered and I said no, that’s why I was there. They then told me sorry the event was full. ‘I’ve already paid online and know my number though?’ I said to them. ‘So you have registered?’ they ask. No, that’s why I was there. I paid online a few weeks ago and I was here to register and pick up my race number. Eventually I got my race number. I was also given an ankle chip timer – first time I had had one of them but very comfortable. Back on to the Inch and it was starting to get a little busier. I looked around for the start but couldn’t see anything obvious. I could see the finish where the half marathon runners were still coming in and wondered if that was it. Across the tannoy it was announced we were to go to the start. I decided to just follow the crowd but everyone seemed to be saying the same thing ‘where’s the start?’. Luckily in a local event there’s always someone who knows so we found it. There was a 5k walk as well and we were all starting together so we were told runners at the front, walkers at the back. There was the usual jostling around for a space and I almost got elbowed in the face so I just kept moving back. I was beginning to shake though as my anxiety starting kicking in – I think it was because we were really bunched up and crowded but I really didn’t like it. I tried to focus on just finishing and soon we were off. I remembered to set my Strava app off as I crossed the starting mat too. I knew the route well as the first half is a regular run for me so I was happy with this. After the first 1km I had gotten through the crowd so I was beginning to feel better. There were quite a few kids running it which was nice, I haven’t run a race with kids before. Round the golf course we went and then past the cottages. It was here I heard a familiar voice and it turned out to be the guy who takes my running group. Not going to lie, felt really good I was running at his pace! Of course he was talking away and I was panting and sweating but still – I was pleased! I tried to use him as a pace maker to the end but he took off and I came in about 45secs behind him. I should also point out he had completed the half marathon earlier that day. I don’t care though, we still finished practically the same in my eyes ha ha. My lovely mum was at the finish line with my little one cheering away so I took my goodie bag, removed my chip and went straight over to them. We didn’t hang around (I couldn’t handle the crowd) so grabbed a couple of ice creams and walked home. As I was eating my ice cream I checked my Strava only to find I hadn’t stopped it when it finishing! This frustrated me beyond belief! It’s crazy how something so small like that can be so irritating. Still annoys me now. Overall a good run though. Not greatly organised and I’ve heard a few people saying they won’t be back next year for many reasons but I probably will. The medal was surprisingly good I have to say. I might even do the half next year. Why not, it’s local. Next up is farklet this week and a long run in there somewhere! I have come across a website that sets ‘races’ for people who struggle to fit in races due to, well, life basically! It’s not easy finding the time with kids, partners, work etc. Then there’s the travel and the cost. So this virtual site offers monthly races to take part in where you run your race, submit your evidence and they send you a medal – and some of the medals are pretty cool! A percentage of the money goes to charity as well so it’s win/win really. I’ve done 2 so far and I’m waiting to see how long it takes for the medals to come. I was surprisingly excited to see a spreadsheet published with people’s times on – that’s definitely motivating me! 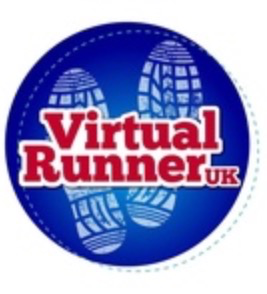 One of my Facebook groups has many members doing the virtual runs as well so it’s very encouraging. Last night I went for my Virtual Summer 5k. I found it very difficult to stop at 5k to be honest but you’re meant to treat it as a race so I did and walked the last bit home. Ok, that’s a lie, I walked for a little bit then sprinted the home stretch ha ha. It was no personal best run but I have to keep reminding myself I’m still on recovery. My new running clothes certainly helped too! It’s been a week now since my operation. I managed out for a run 4 days after it but it was hard, felt very out of breath, light headed and my wound was hurting. Decided to wait until the evening the next day to go out as was light headed at lunch and that run was good. Helped by a lovely cool breeze! The next day though was really rough – never struggled so much like that before so have the day after a miss. Back out today for a 10k and then in to the gym for some weights. Did struggle today again – I’ve noticed the few days rest combined with an operation does set you back – specifically on the breathing. I’m ridiculously frustrated by this – I feel ok and struggle to understand why my body won’t let me do this. I have accepted this weekend I won’t be able to do my local half marathon, again a bit frustrating but I can’t push to do it. So it’s just a 5k for me on the kilt run. Better than nothing though. I also noticed the weights were a little struggle today too but I almost expected that, I can feel it in my core when I’m doing them and given that’s where surgery was this makes sense to me. It is a stark reminder how easily things can go backwards. So that, I will remember. Next time I don’t quite feel like it, or consider cutting a run short, or missing one of the exercises at the gym. Yes it’s ok to occasionally do that but just focus on the end goal. There’s no such thing as a ‘bad’ run.